Despite having finished all repairs the airplane has been grounded till we got the engine sorted out. David Whitaker, Ron Marcotte and new volunteers Michael Craig and his father Don Craig went to work double-checking the magneto and cleaning the fuel system. Michael is an A&P mechanic and noted a moderate number of other small issues needing attention - air in the tires, frayed wires on the mag connections, poorly done safety wire on the interplane struts, etc., etc. So all these areas received attention. Just before mid-day the airplane was moved out to the field for an engine run after lunch. Ian Whitaker sat in the cockpit and made engine noises until the motor actually started running, when he switched to machine gun noises! The engine run seemed good, so the pressure was on Steve Freeman to try flying the airplane. However, the winds were variable, sometimes stopping completely, sometimes blowing straight down the runway, sometimes blowing from 15 degrees off runway centerline to nearly 90 degrees off centerline! Later in the afternoon the winds seemed calm enough to fly. The airplane was pulled to the south end of the runway and the engine started and run up. Steve took off but only made 1.5 circuits of the field before landing (really pretty straight - maybe the new steerable tailskid actually works!). The engine sounded rough in the air and it wasn't just Steve working the blip switch! Some work needs to be done to eradicate the rough running and misfire. But overall it was good progress! Ron Marcotte took a video of the Fokker flying and posted it on YouTube, check out Fokker Dr.I !! The process of re-rigging the aircraft continued. The first step was to sweep about 2 inches of fine dust off the Shop pad - the winds had blown from the south at some point the prior week! The Canuck was wheeled over from the hanger and propped up on the pad. The first step was to re-level the fuselage's top longeron. The steps that needed to be accomplished were to set the angle of incidence of the wings and to re-rig the controls. The ailerons in particular were way off harmony with the changes to the wings! Dave Orloff, Dave Edgerly, Dave Miller, and Dave Freeman - ooops… "Steve" Freeman all worked to make the Canuck right. By the end of the day they were starting to safety wire the bazillion turnbuckles scattered throughout the wing structure. Steve stated he would continue with the safety wire process during the week. Steve hopes to fly the Canuck on the 17th - and he warns that getting the rigging really right will be an iterative process. 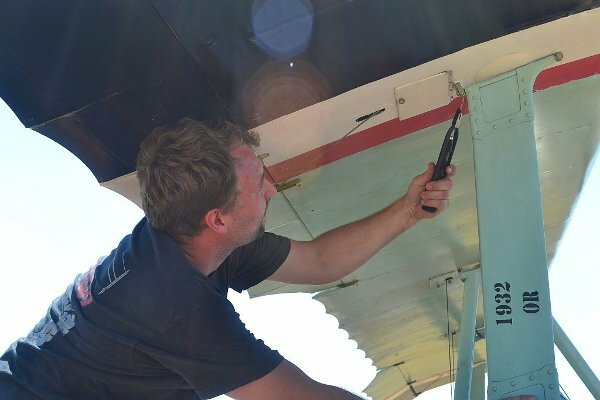 Typically you continue making small changes to fine tune the airplane over several flights and adjustment periods. But who knows, maybe we'll have dumb luck and be right on the money the first time out of the chute! 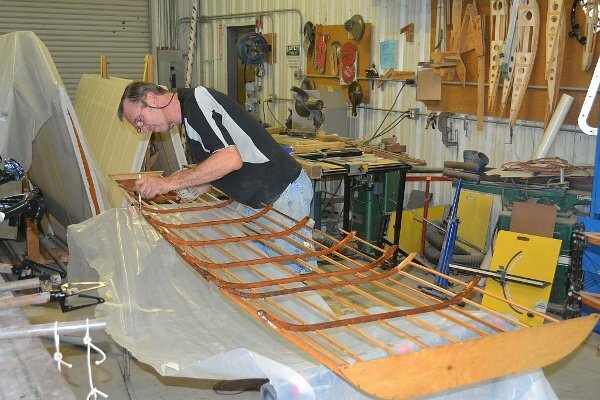 Steve Richardson spent most of his day, assisted by Dave Miller, varnishing various Tommy belly forms and landing gear spreader bars. Steve is a patient man…. At the end of the day Steve had epoxy varnish on both belly forms, although one may still need to be flipped to finish the piece. Both sets of landing gear spreader bars were varnished and drying. There may be some touch up painting still needing to be done on the landing gear parts, but the main gear for both airframes should be about ready for reassembly. Attention will need to be refocused on the fuselages and wings of the airplanes. Cameron Whitaker worked on rebuilding a carb for the Model T French Ambulance and repaired a few other odds and ends on the vehicle. Some work remains before the French Ambulance runs properly. 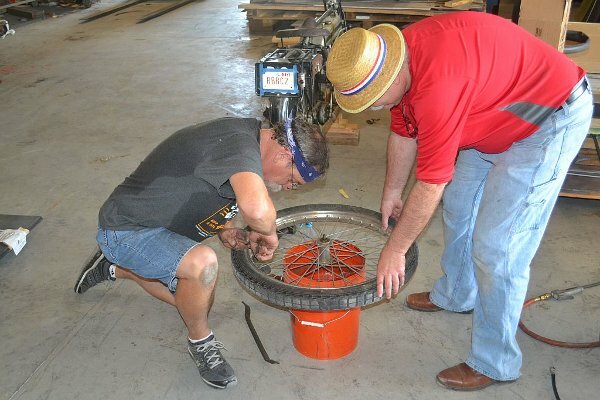 Kevin Monahan spent the entire day, almost, changing the tires on the 1921 Triumph motorcycle! Kevin is another of those capable, competent, and extremely patient men! To the best of my knowledge Kevin didn't pinch any inner tubes, and successfully reseated the tires around the convoluted rim lips! Several people were tootling about the airfield afterwards on the Triumph, including Kevin wearing an olive drab pith helmet (I am sorry I didn't get a photo of that!! ).